Did you know you can offer paid memberships through a simple online form? If you thought offering online memberships was challenging because it involved a recurring payment each year (or month), you’d be wrong. 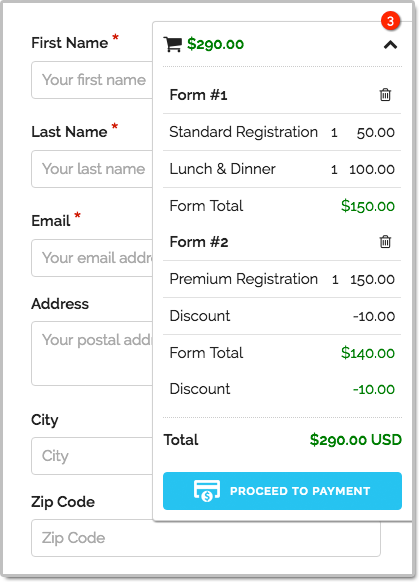 Making a membership or subscription form with FormSmarts is (almost) as easy as making a one-time payment form. Before discussing how to make a membership form, let’s first define what a membership is: A member of an organization or membership site may take part in the activities or otherwise claim the benefits exclusively offered by the organization or site to its members during the period of time covered by the membership (one year or month or any other period of time) by paying a membership fee. To remain an active member after the initial period of time, a member needs to pay again. Because most members want renew their membership, membership fees tend to be recurring payments. When someone signs up for a recurring payment, also called subscription, they agree to be charged a fee at the time they subscribe and again after each period of time specified — until they cancel their membership. How Can I Make a Recurring Membership Form? The short answer is: simply by writing “Recurring Membership ($100 USD/year)” on a form. FormSmarts will understand that the person filling out the form should be charged US$100 each year for a membership called “Recurring Membership”. Like with other types of payment forms, you may add a recurring fee to a form in a radio button option, check box, drop-down list option or text block. 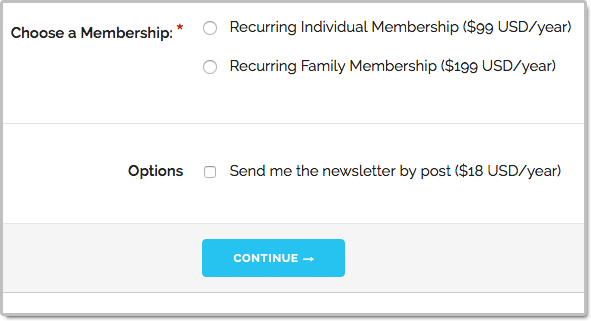 You may allow users to select more than one recurring fee on a form like on the membership form shown on the screenshot above (feel free to try the demo), but all fees must then have the same Recurring Period and Recurring Times. When someone selects multiple fees, FormSmarts will charge them each time for the total amount. If a form has multiple recurring fees, all of them must have the same Recurring Period and Recurring Times. Many membership sites offer new members a trial period allowing them to access the site at a low or no cost before having to pay the full membership fee. A fee with terms (i.e. Recurring Period and Recurring Times) different from the first recurring fee listed on a form is interpreted by FormSmarts as a trial period. Our membership form demo has a trial period. If cloud storage is enabled, the details of a membership and all associated payments are listed on FormSmarts on the page corresponding to the initial form entry. A link is provided in every email notification. Posted on Oct 20th, 2016 in payment form. FormSmarts has long supported one-time donations as part of a dedicated donation form, together with other fees on a registration form, or even on a form using our SuperCart shopping cart. We are pleased to announce that FormSmarts now also supports recurring donations. A recurring donation allows a contributor to sign up for a donation plan to give the same amount at regular intervals, typically every month or year. In the Form Details screen of the form builder, set the On Submission option to Integrate with PayPal using advanced integration. As illustrated on the screenshot above and in this demo, you may add multiple donation boxes to a form to give contributors the opportunity to choose the causes they wish to donate to and allow them to contribute to several causes in a single donation. 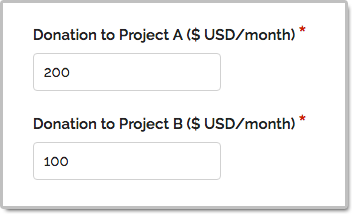 In the example above, the donor is signing up to give a total of $300 each month; with $200 to support Project A and $100 going towards Projects B. When several donation boxes are added to a form, all of them must have the same Recurring Period and Recurring Times. Posted on Oct 13th, 2016 in payment form. We’ve completely redesigned the user interface of our SuperCart shopping cart to provide a more refined and intuitive user experience. SuperCart is FormSmarts’ shopping cart. SuperCart allows a user to submit multiple payment forms — each with one or more priced items on it — and pay for all of them at the end. The customer first enters the information of the first participant and chooses the relevant registration options. Once the customer has submitted the form, all fees and priced options are listed in the shopping cart. 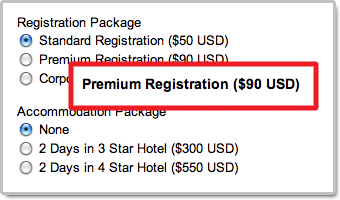 In the example below, the registration options for the first guest include two fees: Standard Registration and Lunch & Dinner. Please try our SuperCart demo and give us feedback. Create a form with fees formatted like on any FormSmarts payment form. Set the Return URL of the form to the FormSmarts.com URL given by the form builder. If you prefer to embed the form onto your site (which we don’t recommend with SuperCart), use instead the URL of the page where the form is embedded. 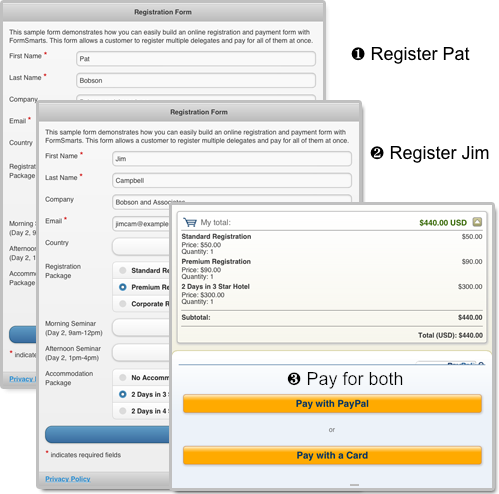 In the Form Details screen of the form builder, set the On Submission option to Integrate with PayPal using SuperCart. If you haven’t already done so, remember to set up your PayPal account for payment integration. Most users set up SuperCart to allow their customers to submit one specific form (e.g. registration form for event A) multiple times to register multiple participants, as presented in the scenario above. then pay for the total amount. Flat discounts and discount codes are supported, but percentage discounts are not. The new shopping cart is only available with the latest generation of FormSmarts forms. If you’re still using an older version, please update your site now. Please share your thoughts and feedback about the shopping cart. Post a comment or let us know on Twitter @FormSmarts or Facebook. Posted on Sep 26th, 2016 in payment form. FormSmarts allows you to offer three types of discounts to your customers on your PayPal forms: fixed amount discounts, percentage discounts and discount codes. You may offer more than one discount, but not more than there are paid items selected. Last but not least, FormSmarts now supports discount codes. 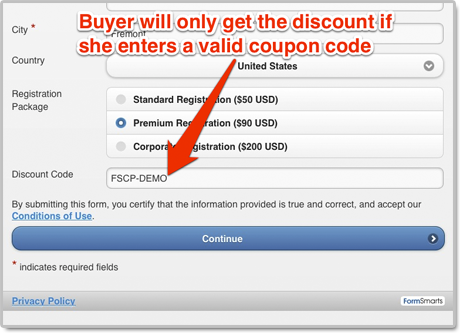 With discount codes, the buyer will only get the fixed amount discount if they enter a valid coupon code. Create the discount code on FormSmarts with the API Console as documented and shown in this video. 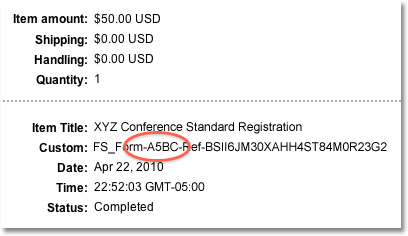 Promo codes must start with FSCP- and may only contain alphanumeric characters and dash. Posted on Feb 1st, 2013 in payment form. A little known feature of FormSmarts’ Advanced PayPal Integration is SuperCart. This feature allows a user to submit multiple online forms that include a payment and pay once for the total amount at the end, thereby providing the buyer with a better ‘shopping’ experience and reducing the seller’s PayPal fees. Let’s review two typical uses of SuperCart. Note: This article discusses an early version of SuperCart. Although it content has been updated and is still relevant, please also read our introduction to the SuperCart Shopping Cart. The first typical use for SuperCart is to create an online form to register attendees for an event. For illustration purposes, I’ve made a registration form for a conference. We want each attendee to be able to choose a different registration package, pick the seminars they would like to attend and optionally add an accommodation package. With SuperCart, a user can register multiple delegates by submitting the registration form for each one, then pay for all of them at once. In the illustration above, we submit the form once to register Pat selecting the standard registration option, then again for Jim, opting this time for a premium registration and adding accommodation. We then proceed to PayPal to pay for both registrations. This short video shows how this works in practice. Another common use of this feature is to create an order form allowing a buyer to purchase several products or services while being able to customize options for each one. I’ve built an order form demo to allow customers to configure and order goods (greetings cards in this example). Each product can be customized based on the options selected on the order form. With SuperCart, the buyer will be able to order as many products as they like by submitting an order form for each one, then pay for all of them at once. Set the Return URL of the form to the URL of the page the form is embedded into. If you’re using the standalone form, enter the FormSmarts.com URL given by the form builder instead. 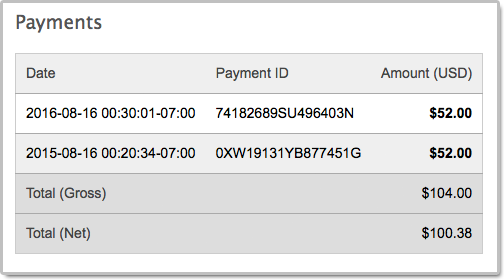 In the Form Details screen, set the On Submission option to Integrate with PayPal using SuperCart. If you haven’t already done so, remember to set up your PayPal account for Advanced PayPal Integration. Set up your PayPal forms with SuperCart whenever you would like to allow a buyer to pay once for multiple form submissions and providing a single form would affect the form’s usability because each registration/order has too many options or you expect someone will submit more two or three registrations/orders. If it’s unlikely buyers will submit more than one form you should use a regular payment with Advanced PayPal Integration instead. Posted on Jan 4th, 2013 in payment form. Posted on Apr 28th, 2011 in payment form. Many websites allow visitors to access online content and services for a monthly subscription fee. Creating a subscription form is somewhat different from creating a regular payment form, because it involves setting up a recurring payment, so that the buyer is automatically billed a fixed amount of money at a fixed interval until the subscription is canceled. The online form builder’s payment integration feature now supports PayPal Subscriptions. 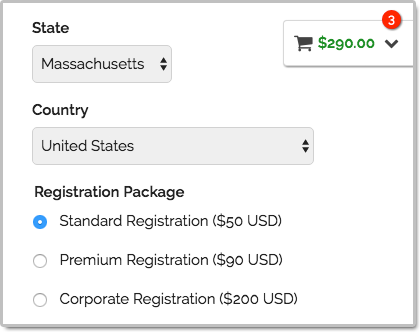 Add radio buttons, a drop-down list or a checkbox, and enter the description, price and duration of subscription options formatted as My Subscription ($19.99 USD/month), as shown on the screenshot above and in this demo. Like in the example presented in the first section, you may specify a trial period for the subscription. This is typically used to give a free trial subscription to the buyer before he is charged for the first billing cycle. The buyer will not have to pay anything if he cancels the subscription before the end of the trial period. Any trial periods must be placed on the form after the main subscription specification. A payment in installments is a recurring payment where the number of payments is fixed. As always, your feedback is important to us and is our primary source of inspiration for developing new features. You can also post your questions and comments on Facebook and Twitter (@FormSmarts). Posted on Jan 17th, 2011 in payment form. The recent upgrade introduces some changes in FormSmarts Payment Integration (PayPal Form) feature. Chargeable items may now be placed in check boxes. This should prove valuable in situations where you’re building a form with one or several optional, individually priced items. Payment button instead of link. We’ve replaced the payment link on the confirmation page by a more outstanding button. Form ID now shown in PayPal report. Up to now, when you needed to reconcile a payment with the corresponding form submission, you could only rely on the FormSmarts Reference Number. This is the unique ID shown in the subject of emails containing form data and in Form to Excel reports. The same ID appears in the payment details in your Paypal account, and also in the CSV report you can generate. We’ve now added the Form ID (see screenshot) to the information available on PayPal, so you may quickly identify which form each payment is for. We warmly welcome your feedback. Posted on May 5th, 2010 in form builder. FormSmarts PayPal Integration is your best option when you need to collect data and get a payment on a form. It makes it very easy to include a PayPal payment in your forms, while giving you the power, flexibility and ease of use of a full-featured online form builder. Tip: The demos above are hosted on FormSmarts, but you can also embed a form on your own website with the code snippet given by the form builder. Do you need help making a PayPal form? Add radio buttons, a drop-down list or a checkbox, and enter the description and price of products formatted as My Product Description ($30 USD), as shown on the screenshot below. That’s all you need to do. We’ll pick up the products and quantities that were selected, and we’ll redirect the user to a pre-filled page on Paypal for payment. Payments will be sent to the PayPal account matching your FormSmarts login. You can change your login if needed. You can as easily charge for several items within a single form submission by adding other drop-down lists or radio buttons formatted as just described. If you’re building an order form, you will need to allow the user to enter the quantity or number of products they want to buy. Set the field type to Positive Integer. You can also allow the buyer to select a quantity in a predefined list using radio buttons or a pull-down list, like on this demo. A membership or subscription involves a recurring payment at each billing cycle until the subscription is canceled. 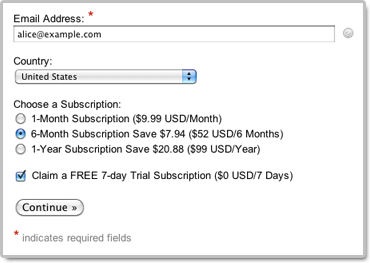 This article discusses how to create a subscription form. Recurring payments can also be used to allow the buyer to pay in installments. A payment by installments is a recurring payment where the number of payments is fixed. The syntax is Payment in 12 Installments (12x$9.99 USD/month). See this sample form. Set the field’s widget to Text Box. You may add multiple donation boxes to a form to allow contributions towards multiple projects or causes in a single donation like on this demo. FormSmarts allows you to offer three types of discounts on your online payments forms: fixed amount discounts, discount percentage and discount codes. The two latter discount schemes only work with advanced integration. To request a payment in a currency other than US dollars, simply change the currency code in the item’s description. For example, use (€60 EUR) to receive a payment in Euros, (£60 GBP) for a payment in Sterlings, and ($60 CAD) to request a payment in Canadian dollars. Note that the 3-letter currency code is required because a currency symbol may be used by more than one currency. For example, USD, CAD, and AUD will all use the dollar sign ($). The text of the button inviting the user to proceed to payment is displayed in his preferred language, in any of the supported languages. To ensure money is sent to the correct PayPal account, your primary PayPal email address must match your FormSmarts login. You can easily change your login. You may receive payments to multiple PayPal accounts with a compatible FormSmarts account. To avoid users having to enter the same information twice if paying by credit card (on the form and on the payment screen), we will attempt to pass their first name, last name, email, postal address, and country to PayPal. Make sure you name the First Name and Last Name fields exactly like this. To allow FormSmarts to recognize an address and populate the billing address on PayPal (Advanced Integration only), name the relevant fields like on this form or this one. To redirect users to you website after they have completed payment on PayPal, visit the Form Details screen of the form builder and set the Return URL of the form to your site’s URL. We welcome your feedback about payment integration. Posted on May 5th, 2009 in form builder. What’s the Return URL of a Form? When creating a new form with FormSmarts Form Builder, you’re asked to provide a return URL for that form. The return URL is where visitors will be automatically redirected to or invited to go to (by clicking a link) after a successful form submission. We also use return URLs to compute the list of websites in Settings > Websites. If you don’t have a web page, simply use “http://formsmarts.com” as the return URL. To prevent abuse, the link to the return URL is only displayed on the confirmation page if the form owner is verified or is a FormSmarts Pro or FormSmarts Business user. Visit the Settings tab of your account to verify your sites. You can set up a form to skip the Confirmation page and automatically redirect the visitor to the form’s Return URL. Note that the visitor will then not get the FormSmarts Reference Number of the transaction. Redirection can be activated in the Form Details screen of the form builder, under On Submission. FormSmarts Pro and Business customers only. For security reasons, browsers won’t redirect users from a secure HTTPS page to non-secure content. So when a form is embedded onto an HTTPS site, the return URL should also use HTTPS. If you use our PayPal form feature to add a payment to your form, the Return URL will be used as the PayPal landing page. Users will be redirected to that page by PayPal after the payment has been completed. Posted on Jul 11th, 2008 in HTML form.